Kilmarnock are also interested in the Englishman, who scored ten times in his last eight games. 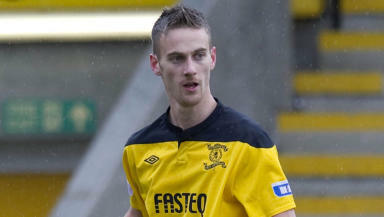 Former Livingston striker Rory Boulding has joined Hearts on trial. The Englishman reported for pre-season training with John McGlynn’s side on Monday, as he looks to win a contract with the SPL outfit. STV understands Kilmarnock are also keen to take the player on trial, should Hearts decide against making a move. Boulding turned down a new deal with Livi in the summer, having scored 12 goals in 29 games during his season-long stay at Livingston. After a slow start to his career at Almondvale, the 23-year-old netted ten times in his last eight games with the club, as well as scoring a hat-trick against McGlynn’s former side Raith Rovers. Boulding moved to Scotland from Accrington Stanley at the start of the 2011/12 campaign, and also had spells with Bradford City, Hucknall Town, Ilkeston Town and Mansfield Town.